Little readers play peekaboo with animals. 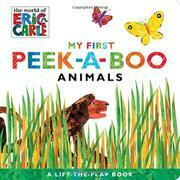 Carle’s iconic illustrations form the centerpiece of this simple lift-the-flap board book. Each double-page spread features an animal obscured by a flap (a solid block of trademark, textured Carle color) on one side and a four-line abcb stanza describing the animal on the opposite page. Readers are given hints about the hidden creature before they play peekaboo and lift the flap to reveal a monkey, horse, turtle, and more. “I’m a big cat, / but I don’t purr. / I’ve got black stripes / and bright orange fur.” Although most of the facts offered are scientifically valid, the ambiguously worded modifier for the monkey’s clue—“With my long tail, / I swing in the trees”—risks imparting the misinformation that monkeys suspend themselves from their tails. Carle’s illustrations are as recognizable to little readers as the characters on Sesame Street or Daniel Tiger’s Neighborhood, and the familiarity breeds appreciation. There’s nothing truly special or distinctive regarding the mechanics of this particular title, but the familiar look acts as a comfort food–esque motivation to get little ones’ attention.